To ice or not to ice? That is the question for Christmas Sugar Cookies! While I love a good sugar cookie with royal icing, this is definitely my favorite sugar cookie recipe! Cut out the cookies, sprinkle with a little extra sugar and bake for a deliciously sweet Christmas cookie! YOU WON’T MISS THE ICING ON THESE CLASSIC SUGAR COOKIES! I like experimenting in the kitchen and bringing you new recipes, but sometimes the old recipes are still better. We have two different family sugar cookie recipes – the first is with royal icing that I shared when I made Wookie Cookies which we like using for themed parties and showers because you can decorate them and the second is these Classic Sugar Cookies! This icing-less sugar cookie recipe is lighter than iced cookies and less sweet despite the extra sprinkling of sugar on the top! That means you can eat more sugar cookies before bottoming out on sweets – or at least it does in my Christmas day philosophy! This was the sugar cookie recipe I grew up with every holiday season and was placed out every Christmas Eve for Santa Claus. My mom would always mix up the batch and divide it into four pieces – 1 for each of us kids. I always thought she did this to be fair and make sure we all got to make our own special cookies, deciding which cookie cutters we used and adding the extra sugar. As I got older, I realized she was genius. She didn’t leave a batch for herself to make. Instead she just helped us make our batches without the main responsibility of cutting them all out. The reason I’m really sharing this random family memory with all of you is to say that this Classic Sugar Cookie recipe makes a big batch! If you need a lot of cookies, use smaller cookie cutters and you can probably cut out 100+ cookies from this one recipe. THE PERFECT LARGE BATCH CHRISTMAS COOKIE! In my books, this makes it the perfect Christmas cookie recipe: one batch can provide enough cookies for Christmas, for a holiday party, for a cookie exchange party, to bring to work or box up for neighbors. Heck it can make enough cookies to cover multiple occasions! Therefore, when people ask which recipe they should make for a party or a holiday cookie exchange, this is the recipe I always recommend. Well this or my Peppermint Hot Chocolate Cookie Cups if they are looking for a really cute, show stopping Christmas Cookie. 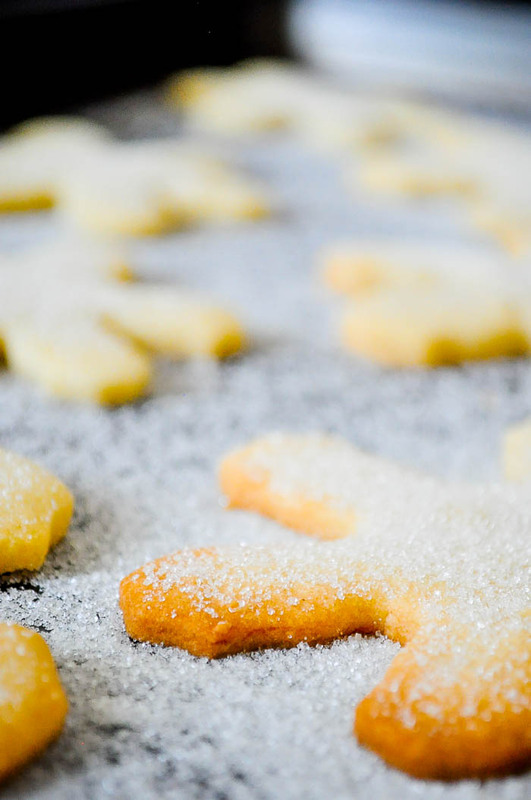 When making this sugar cookie recipe, you’ll start with creaming together the butter, sugar and vanilla until light and fluffy. I prefer doing this in my KitchenAid Mixer with a paddle attachment. Second, add eggs and milk, combining thoroughly. Third, you will add your flour, baking powder and salt. I recommend only adding in half of this mixture at a time, lightly mixing until fully incorporated. TIP: While not required, sifting the flour, baking powder, and salt together in a bowl before adding to the dough will result in lighter, fluffier cookies. Divide your dough as desired (I like to divide in half or in quarters), then wrap in plastic wrap and chill for 1-2 hours. After your dough is chilled, preheat your oven to 375 degrees Fahrenheit. Then, flour your surface and roll out the cookie dough until about 1/4″ thick. 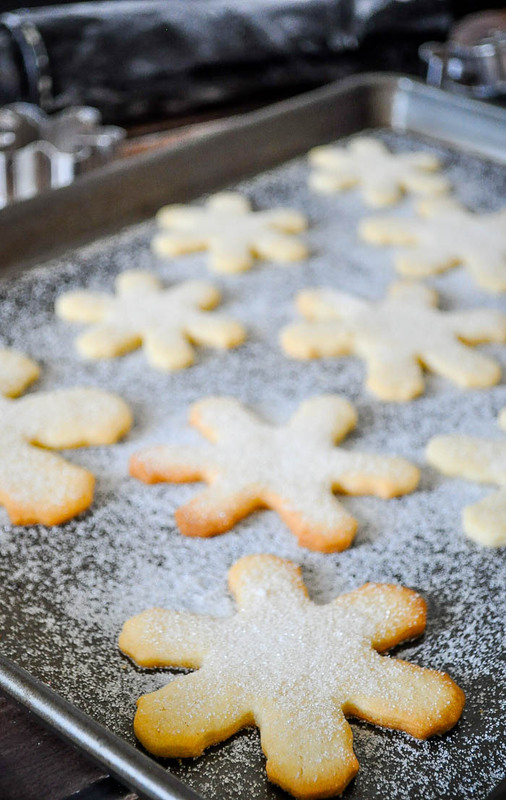 Cut out your cookies into desired shapes, place them on parchment paper or a silicone baking mat, and sprinkle with sugar. Bake for 6-10 minutes until they just begin to get golden on the edges. You do not want to overcook your cookies! HOW TO KEEP YOUR SUGAR COOKIES SOFT? I find the easiest way to keep baked goods and cookies soft is to put a piece of bread into the air tight container or bag. The cookies essentially soak up the moisture from the bread, keeping them softer longer. 10 Piece Christmas Cookie Cutters – From Mr and Mrs Gingerbread Man to a Sleigh and Present, this set has a great selection! Snowflake Cookie Cutters – These are my favorite cookie cutters! I’m a big snowflake fan. Pastry Scraper and Cutter – It’s a tool I use may more often than I thought I would. Great for working with dough and definitely for cleaning counters. 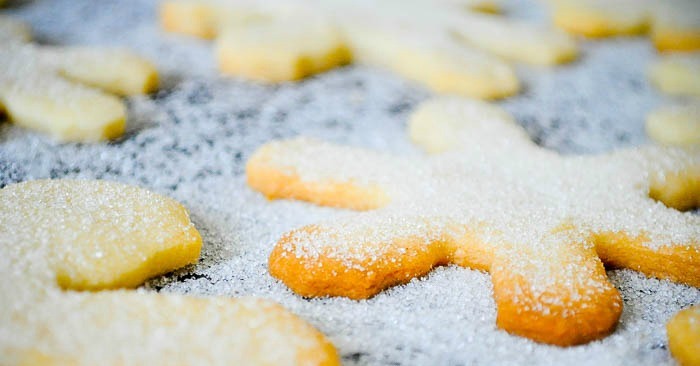 Now, Get to Baking Your Cut Out Sugar Cookies Sans Royal Icing! Soft, sweet holiday cookies that are easier and quicker to make than icing recipes! Plus, it's the best Christmas cookie recipe because it makes a large batch that's perfect for holiday parties, cookie exchanges and neighbor gifts! Add eggs and milk. Combine thoroughly. Add flour, baking powder and salt. I recommend starting with only half the flour at a time. While not required, sift together your flour, baking powder and salt into a bowl before adding to dough. It makes the cookies even softer! Divide as desired (in half or in quarters) and refrigerate 1 hour. Roll out on a floured surface and use cookie cutters to make desired shapes. Then place on your cookie sheet. Top with a sprinkle of sugar and bake 6-10 minutes at 375 F.